We can Achieve Peace through an Inter-Faith Approach! 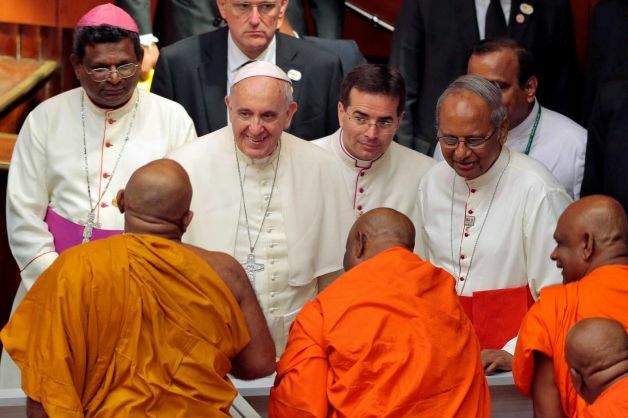 Buddhist and Hindu Religious Leaders with Pope Francis at the inter-faith conference in Colombo Sri Lanka. 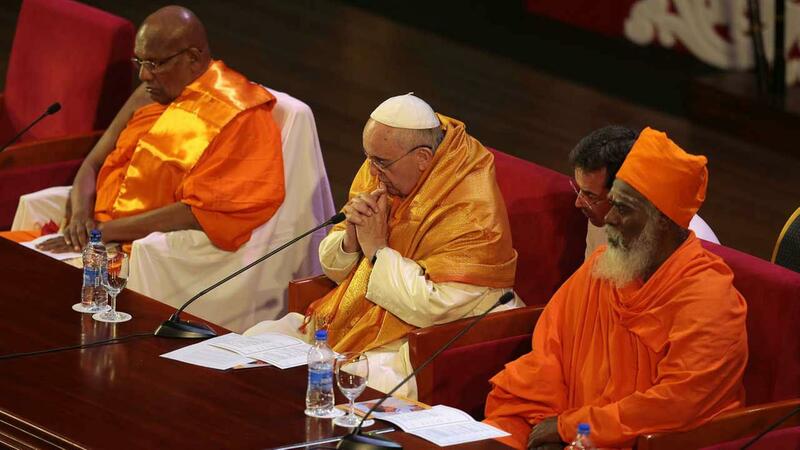 Leader of Sri Lankan Hindu’s honoring Pope Francis at the inter-faith conference at Colombo Sri Lanka. 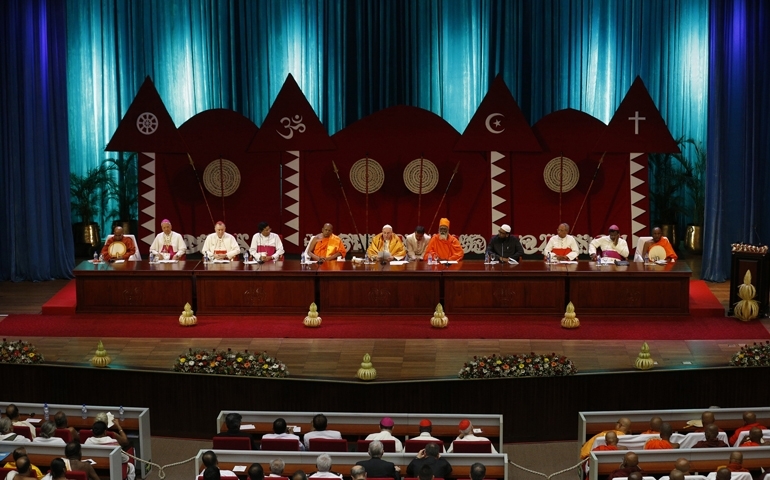 Religious leaders of various faiths at the inter-faith conference in Colombo Sri Lanka. 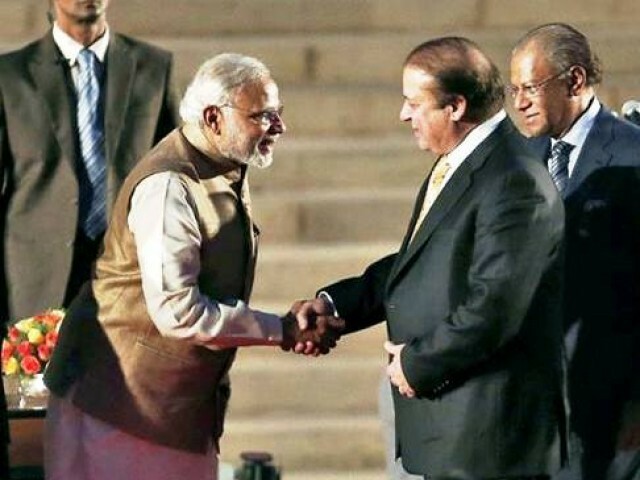 Indian Prime Minister greeting the Pakistani Prime Minister at his inauguration citizen of a Buddhist country. The Mass by the pope was not only attended by the Buddhist but by members of other religions and many of them had mentioned to the media that this is one of the most significant days of their life. All this augurs well for inter-faith corporation and understanding that cam lead to peace, unity and reconciliation. The world has seen many efforts of unity by world leaders. citizen of a Buddhist country. 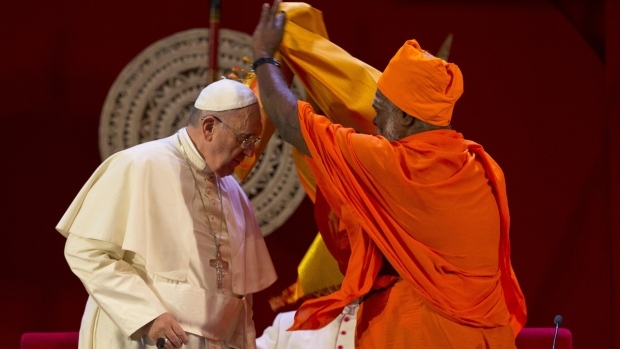 The Mass by the pope was not only attended by the Buddhist but by members of other religions and many of them had mentioned to the media that this is one of the most significant days of their life. All this augurs well for inter-faith corporation and understanding that cam lead to peace, unity and reconciliation. The world has seen many efforts of unity by world leaders. It was really heart warming to see the visions and hear the sound bites of the Inter-faith conference held in Colombo Sri Lanka as a part of the visit by His Holiness Pope Francis on the 1st day of his 3 day visit to Sri Lanka. The conference was led by some of the most senior leaders of Buddhism [followed by the majority of Sri Lankans], Hinduism, Islam and other Christian religions. It was attended by over 1000 members of the clergy of each of the religions. The ceremony included a welcome from a Catholic Bishop, a chant from a Buddhist Monk, blessings from Hindu and Muslim leaders, and an ecumenical Christian prayer led by the head of Sri Lanka’s Anglican church. Each speaker had a message that had peace, unity, reconciliation and respect for each other. Pope Francis said inter-faith work should not blur the lines between different religious convictions and he sought to reaffirm respect for each religion’s beliefs but to ground such respect in a full and forthright presentation of our respective convictions and that religion cannot be used for violent purposes. The Sri Lankan Muslim leader Ash-Sheikh M.F.M. Fazil said, “I will fail in my duties if I do not mention the attack, the killings, that took place in France, in Pakistan,” Fazil said; “Children were massacred and killed in the name of Islam. As we know very well, Islam has no relationship with regard to such practices and evil conduct and deeds,” he continued. “Islam promoted peace, love, and harmony.One of Sri Lanka’s senior Buddhist leaders Niyangoda Vijithasiri Thero who delivered a sermon mentioned all religions are important and used the metaphor of different treatment methods to cure the same disease. Sri Lanka’s newly elected president, Maithripala Sirisena, was at the airport to welcome the pontiff and in his welcome speech mentioned that he is blessed to have the Holy father visit soon after his elections and requested for his prayers. This is significant coming from a Buddhist, the 1st citizen of a Buddhist country. The Mass by the pope was not only attended by the Buddhist but by members of other religions and many of them had mentioned to the media that this is one of the most significant days of their life. All this augurs well for inter-faith corporation and understanding that can lead to peace, unity and reconciliation. The world has seen many efforts of unity by world leaders. In December 2014 President Barack Obama went in to a peace deal with Cuba with a symbolic prisoner exchange and anticipated reforms by Cuba and lifting of embargos by the USA. 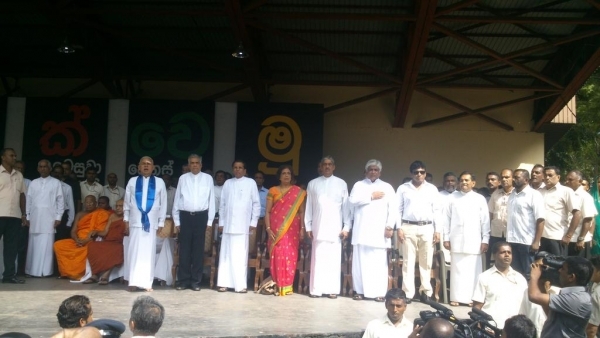 In January 2015 all political parties in Sri Lanka united to appoint a President known for his virtues and to form a government that will reform the political culture in Sri Lanka. A few days ago most world leaders gathered in Paris to show solidarity after the attacks in Paris. It was significant that both the leaders of Israel and Palestine were a part of the world leaders who had locked hands together in solidarity. In the backdrop of the various conflicts, terrorism and armed conflicts going on around the world, these are efforts to find love, peace, truth, justice, reconciliation, unity, progress and happiness to make our efforts to finding love, peace, truth, justice, reconciliation, unity, progress and happiness to make our world a better place. 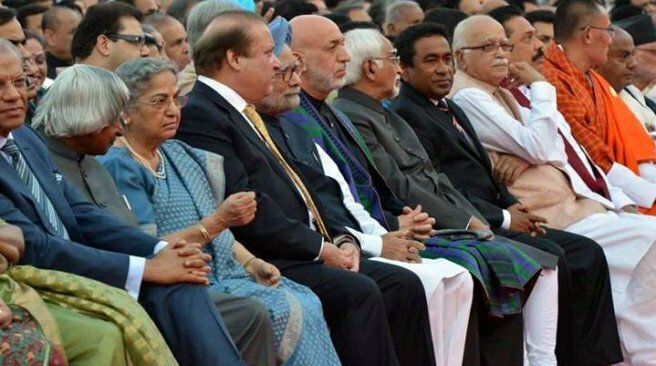 Leaders of the SAARC countries at the inauguration of the Indian Prime Minister. US and Cuban Presidents – Historic Hand Shake. 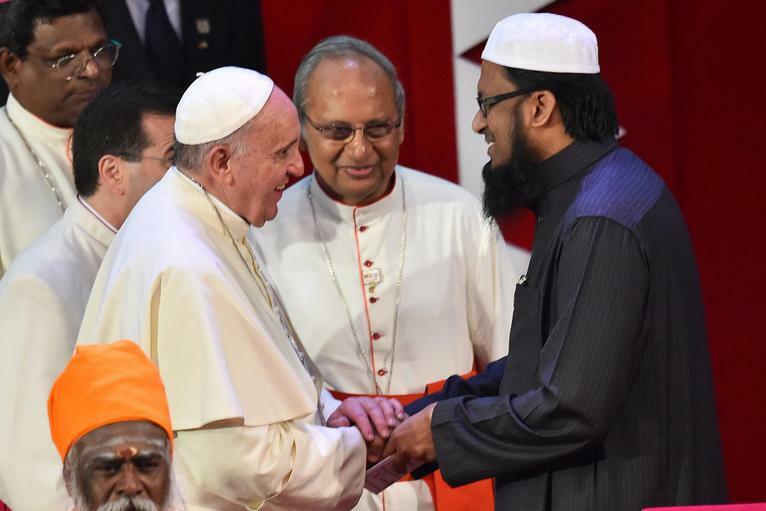 Pope Francis with leaders of various faiths. Leaders of Sri Lanka’s political parties that has joint together to create a positive political culture and successful nation.